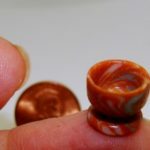 MY NEW ITEM – OOAK 1/12th scale – Dollhouse miniature BRAIDED GARLIC. This listing is for 1 BRAIDED GARLIC. You choose from the left, centre and right.. These little braided garlics are a must in any kitchen in any style dollhouse miniature house. They measure 5.4cm in length and 1.4cm in width. Perfectly scaled. Each garlic is approx. .3cm round. Each braid is different and each garlic is made individually. (no molds – so each is unique) Please look carefully at which item you are wanting to purchase. Currently there are only these 3 for sale. Keep in mind they are all braided garlic but each braid hold different amounts of garlic and are shaped differently.